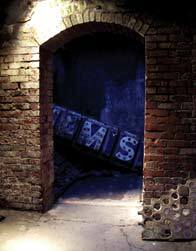 is Seattle’s most unusual attraction, a humorous stroll through intriguing subterranean storefronts and sidewalks entombed when the city rebuilt on top of itself after the Great Fire of 1889. The 75-minute guided walking tour begins beneath Doc Maynard’s Public House, then spills into historic Pioneer Square, Seattle’s birthplace, before plunging underground for an exclusive, time-capsule view of the buried city. 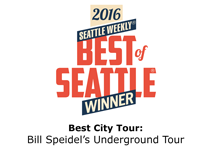 It’s the only way to tour the interconnecting tunnels of the world-famous Seattle Underground—don’t be fooled by impostors. All the while, tour guides regale you with sidesplitting stories our pioneers didn’t want you to hear. It’s history with punch lines! Tickets available in advance, online here and by phone at 206-682-4646, or at our ticket counter at 614 First Avenue, in Pioneer Place Park, Pioneer Square. The tour ends in Rogues Gallery and the Underground Gift Shop, where you’ll find displays depicting the past and Northwest memorabilia. Sons of the Profits, the book by Bill Speidel upon which the tour is based, is our most popular souvenir. 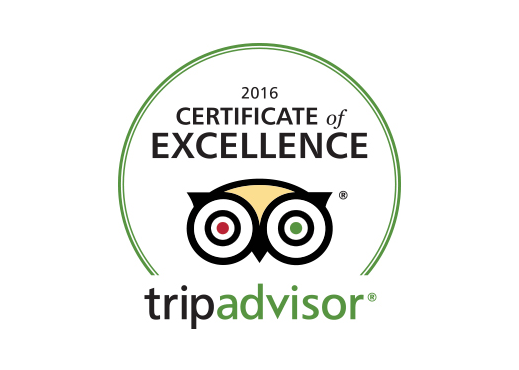 Tours daily, year round, except: Closed Thanksgiving Day and Christmas Day. Tours may be added during peak seasons. Tours last approximately 75 minutes. Children 6 years and under are admitted free, but may find the tour challenging.